For one of my customers I enabled content approval on a list. This should all be quite easy. 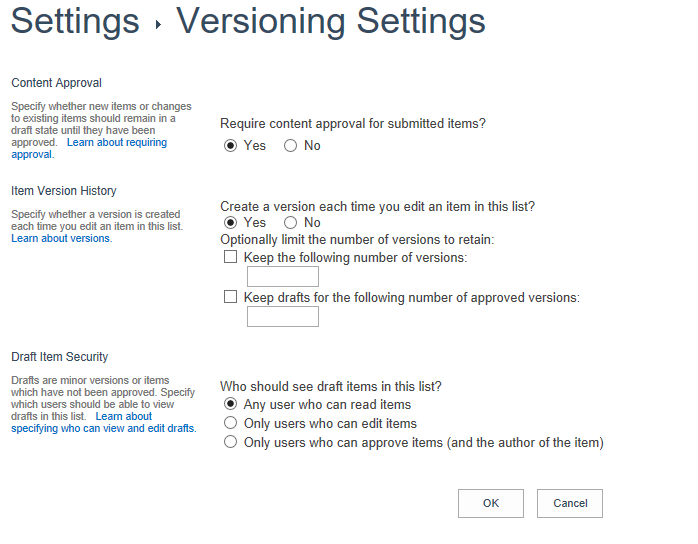 I simply went to the Versioning settings of the list and I found the right options. In this case my customer wanted all the items to be visible to everybody even if the items aren’t approved yet. So there is even an option for this as I found the Any user who can read items can be selected in the Who should see draft items in this list? option. Items on this list require content approval. Your submission will not appear in public views until approved by someone with proper rights. It looks like this warning always appears when content approval is turned on even if the option to make this available to all readers. Something doesn’t seem to be right here! I could of course look into hiding the information bar, however that would also remove all other warnings that may appear on the new item form. ‹ Office 365 – SharePoint Online – Compare different versions of a document. Can’t you refer a custom js to hide this message based on the content ? some jQuery tricks ! Hi Larry, I could do that, however if I then at a later moment change the the content approval settings then I might find that the message will not appear when it should. By the way, I noticed that in the modern list experience the warning doesn’t appear with my list settings.